January makes me want to hibernate, it’s dark, cold and never-ending, I don’t blame bears, trying to avoid it. However, winter may be grey but there’s nothing that says we can’t try to add some splashes of colour to it. I love colour so here I give you my first project of 2015 in a vibrant combination. 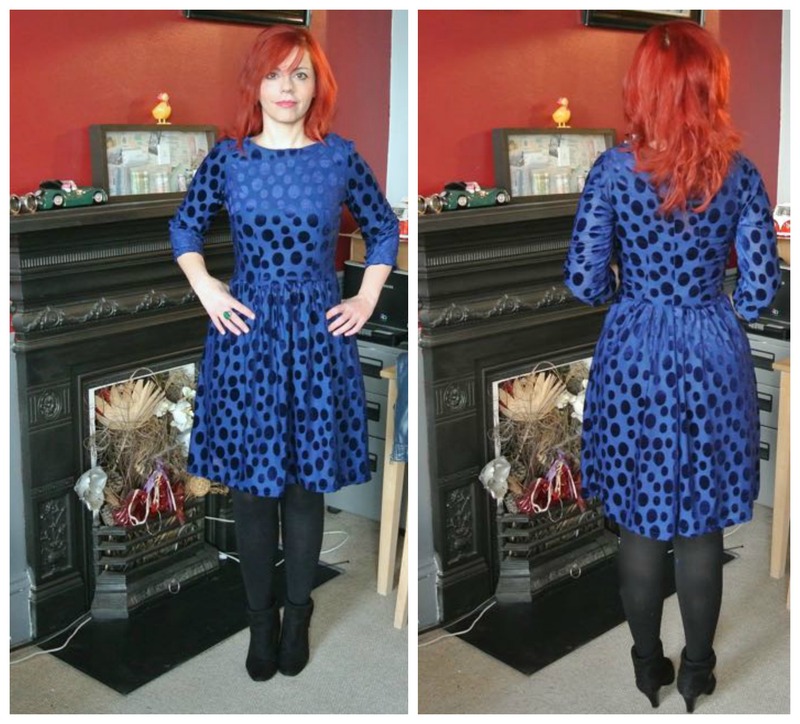 I made the Emery Dress first time sometime in 2014 and worn it only twice. 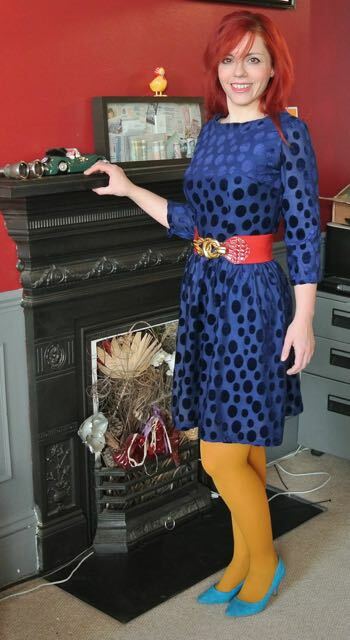 Unfortunately, I have no pictures of that dress, as it’s at the bottom of the “to be repurposed” pile at the moment. In my previous post I categorised the dress in the unfortunate makes, having a few problems that made it uncomfortable to wear. I used it as a muslin to construct the current version, which is far better and more comfortable. I bought this blue velvet polka dots fabric last year and was itching to use it. It’s very light weight with some stretch which made it perfect for this project. I tried to adjust the neckline as much as possible and it’s still not 100% perfect but it doesn’t bother me that much, unlike my previous version. The red belt isn’t probably the best but it was colourful, so I threw that in, haha. Here you can see it in a safer, not so loud and perhaps more polished combination. I still find the gathering around the waist a bit challenging, and in the back there’s more gather in the middle than there should be. I omitted the zipper (hurrah) as the stretch of the fabric makes it possible to put it on with out it. I also left out the pockets, because I feel they add bulk in the wrong parts of my body. I used the quarter sleeve version, which is probably my favourite sleeve length. I cut size zero for the bodice and took out about 2cm from the neckline and about 1cm from the side seams due to the stretch of the fabric and a size two for the skirt. I also took out about 6cm from the hem, as I prefer my dresses a bit over the knee. On other news, I would like to say a big thank you to everyone who visited my blog last year ( I know I’m a bit late with my thank yous, but better late than never), commented, liked and voted for my Francoise dress, even if I didn’t win. I also made my first crochet cushion, so you may see more crochet makes here later in the year. Finally I just enrolled for the Craftsy Patternmaking Basics: The Body Sloper, as I would like to experiment with different ways of manipulating it. 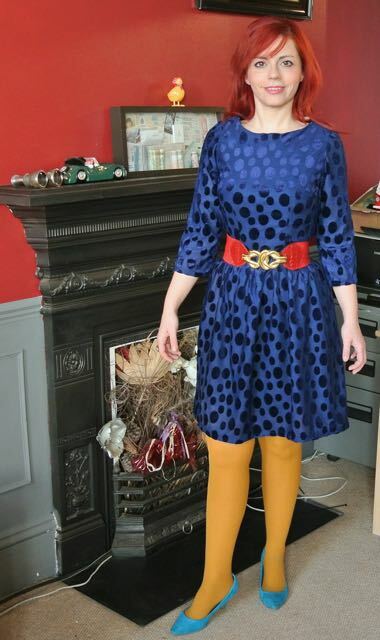 This entry was posted in sewing and tagged Christine Haynes, dress, Emery dress, handmade, Polka Dot January, sewing, stashbusting. Bookmark the permalink. I love that fabric and your pattern choice is really flattering. You look lovely! YES, for color in winter! Thank you! It did turn out better than what I thought, I probably never wear all these colours together but the yellow tights will definitely go with it at some point!! What a great dress 🙂 I really love the colour and looks fab with the leather jacket! Thank you!! 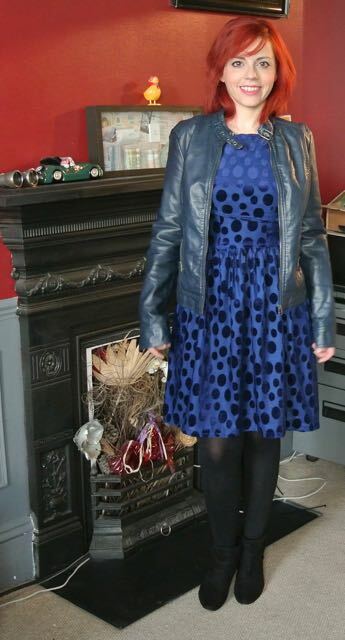 I tried it first on with a blazer but looked somewhat formal, so the leather jacket is definitely a winner ensemble. Colour looks fab with your hair 🙂 A great splash of colour for the dreariest month of the year! Thank you!!! Yes colour is imperative until it comes back with nature. Such pretty fabric! And I love that your hair goes with your room, LOL! Thank you! Underneath it all I’m a chameleon, always trying to blend in with my surroundings haha! But you’re right i was thinking the same thing looking at the pics, need a different wall! Haha! Thank you very much!! This version does more justice to the pattern, I think! You will have to post about the Craftsy course. I’m curious. I’m planning too as i’m curious to see how it’s going to work and wherher it’s better than a book! I’m starting it at the weekend! Amazing dress and love your fabric choice. Was it difficult to work with velvet? Thank you! The velvet is only on the dots but it created a lot of fluf when i was sewing it! I’ve never really tried sewing velvet especially with stretch, i imagine it may be a bit sticky but maybe not! Sorry not very helpful! OMG I love that dress. And I love the bold colour choices. I keep trying to remind myself to turn away from black, black, black.